expanding the availability of prescribing data through initiatives related to Canada Health Infoway E-Prescribing System. According to the Minister, this announcement represents the most significant suite of changes to impact pharmaceutical pricing proposed in over two decades. Please see the summary below for more information on the Minister’s comments. Working with provincial and territorial jurisdictions to enhance the capacity of the pCPA with an announcement anticipated in the coming weeks. 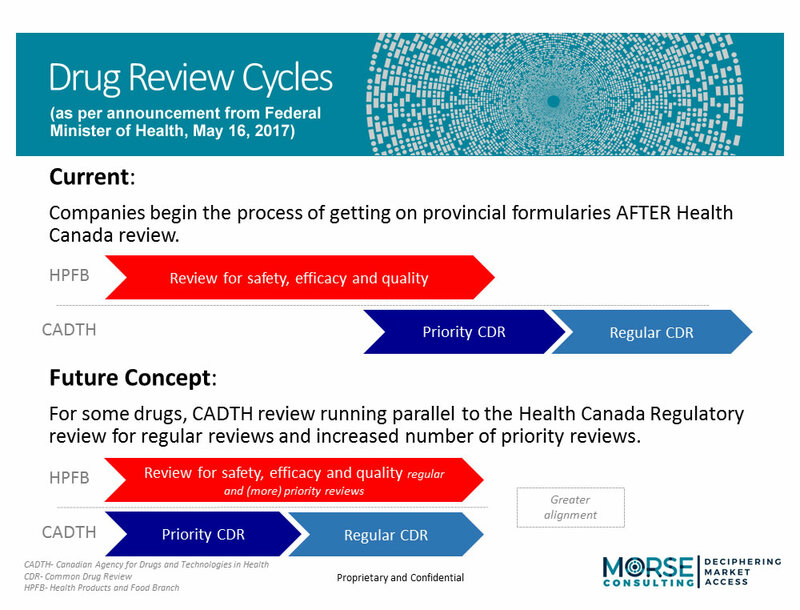 Align process between Health Canada and CADTH and, if possible, move towards concurrent reviews. Currently pilot testing the combined process with CADTH. Will provide guidance to drug sponsors early in the process to help them meet the needs for both Health Canada and CADTH when they are submitting their application. The Minister noted that Canada has numerous public and private drug plans with various formularies. Minister Philpott has raised this topic to provincial and territorial colleagues to positive feedback and she intends to continue to raise this issue in upcoming Health Ministers’ meetings. She noted that there are options to consider such as starting with a small list of essential medicines (including the majority of drugs in common use), or focusing on joint decisions to list new drugs as they enter the market. In addition to the work of the Canadian Institute for Health Information (CIHI), Canada Health Infoway’s E-Prescribing System will play a role in expanding the data available. The Minister noted that once complete, this new drug information system is going to be a comprehensive system helping to improve the safe use of prescription drugs for Canadians.